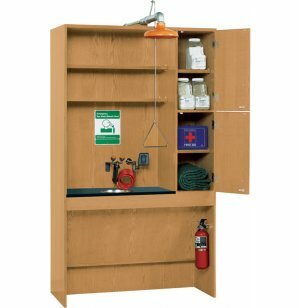 The Complete Safety Station by Diversified Woodcrafts allows you to store and organize all of your safety equipment in one place. A built-in eyewash and shower are within easy reach of all other cautionary supplies, such as spill kits, first-aid kits and fire blankets (not included). The shower head has a high-volume, continuous water flow, with a stay-open valve that is activated by a convenient pull handle. A stainless-steel bowl is mounted into the counter beneath the eyewash. Eyewash can also be detached from the safety station and pulled up to 12' away, allowing eyes and other small areas to be irrigated easily. A paddle handle turns on the stay-open valve of the eyewash, enabling hands-free use. 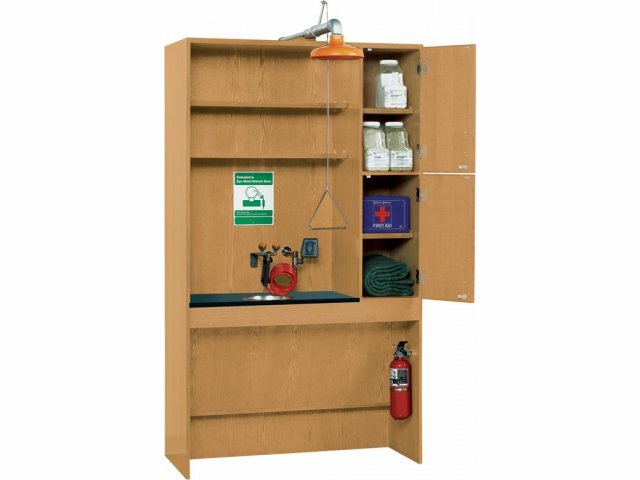 Built from attractive oak and oak veneer, the Safety Station comes complete with upper shelving and side cabinets for extra storage space. The area beneath the countertop is spacious and open, to allow mounting of fire extinguishers and other safety apparatus, as well as adequate wheelchair access. Organized: All safety equipment can be accessed from one location, with a built-in shower and eyewash. Built-to-last: Oak and oak veneer construction, heavy-duty countertop and stainless-steel bowl, are constructed to withstand tough use. Convenient: Easy-to-reach pull handle and well-situated paddle handle provide quick and efficient activation of the stay-open water valves. 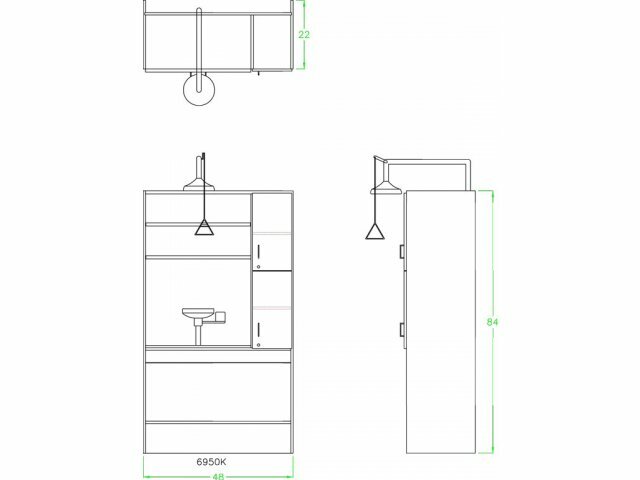 Wheelchair Accessible: The unit is ADA compliant, with an open area beneath the counter that accommodates wheelchairs easily. Note: This unit should be secured to the wall for safety; mounting hardware is not included.